Support Healthy Bones and Teeth with Vitamin D3 2000 IU. Vitamin D3 2000 IU from Natural Healthy Concepts is a daily nutritional supplement of vitamin D3 (as cholecalciferol from wool oil) in convenient softgels. Vitamin D3 is a fat-soluble vitamin that is biologically identical to the vitamin D synthesized in the body from cholesterol after the skin is exposed to ultraviolet rays from sunlight. Vitamin D3 is an essential vitamin that can be taken as an oral supplement to promote optimal health. This form of vitamin D helps your body absorb and properly utilize calcium and phosphorus to help maintain healthy bones and teeth. Natural Healthy Concepts’ unique brand of nutritional supplements include quality professional products that are hypoallergenic, gluten free, dairy free, soy free and nut free. It’s never too late to get started on supporting your health the right way! Try Vitamin D3 2000 IU for yourself today! Vitamin D3 2000 IU Product Details. Good source of essential nutrition. Supports bone health. Supports immune function. Hypoallergenic formula. NSF certified. Daily softgels. 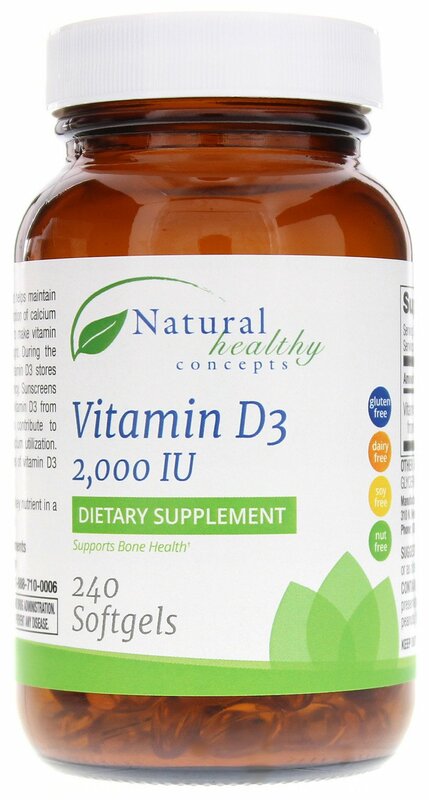 If you’re looking for a vitamin D supplement from a trusted professional brand to help support optimal health, try Vitamin D3 2000 IU from Natural Healthy Concepts. It may help you meet your natural health goals. Other Ingredients Other Ingredients: rice bran oil, gelatin, glycerin, purified water. Serving Directions Adults:† As a dietary supplement, take 1 capsule daily preferably with a meal or as directed by your healthcare practitioner. Precautions Warning: Consult your healthcare provider prior to use if you are pregnant, nursing, taking any medications, or have any medical conditions. Keep out of the reach of children.